Close your eyes and imagine for a moment that you’re in Tuscany, surrounded by rolling green hills, clear open skies, and abundant wineries. You breathe in the fresh Italian air. You catch the scent of freshly baked loaves and imagine the taste of the region’s finest Sangiovese grapes. Ahhh, one can dream. 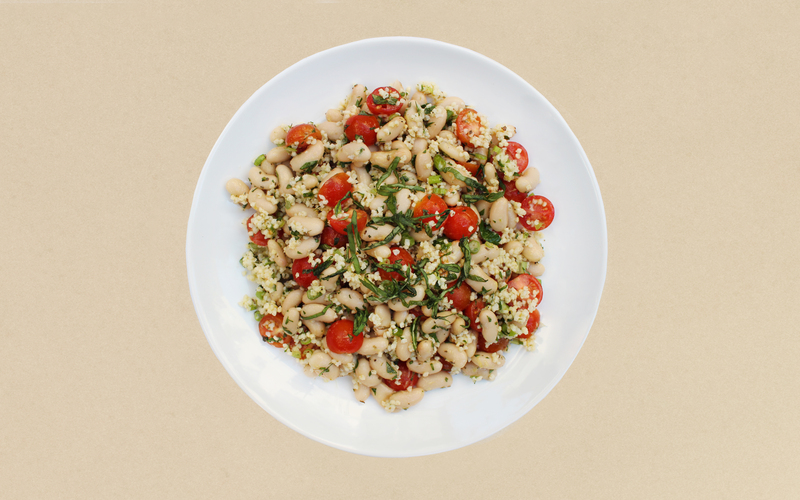 While we can’t promise you the glories of a visit to Tuscany, we can promise you a tiny taste of Tuscany with our Tuscan White Bean & Millet Salad. At the root of Italian cuisine, there are fresh ingredients. And that’s exactly what we’ve used to create this recipe. For our salad, we begin with white beans, which contain protein, magnesium, and vitamin C – not to mention, they’re a great source of fiber. Like white beans, millet is also an excellent source of fiber. Millet contains magnesium, vitamin B6, and iron, making it an amazing addition to a dish for your little one, and for you. Tomatoes add an extra dose of vitamins A and C. We’ve topped it all off with a fresh herb and lemon zest dressing that will leave you feeling energized and refreshed. For breastfeeding mommas, this salad is the perfect option if you’re looking for something that is nutrient-dense and filling. This plant-based dish pairs nicely with grilled chicken, if you are looking for an extra protein boost. What more could you ask for? Journey on, mommas. White Beans. Millet. Tomatoes. Fresh Herbs. It'll feel like you're in Tuscany. 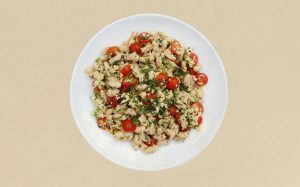 In a large mixing bowl, combine millet, white beans, green onions, basil, and parsley. Leave the tomatoes to the side. In a small mixing bowl, whisk together olive oil, lemon zest, lemon juice, sea salt and pepper. Drizzle the dressing mixture into the large bowl, and mix until all of the ingredients are covered. Gently mix in the cherry tomatoes. Garnish with basil, if desired. Chill or serve immediately. Buon appetito!